~Bunny Lane Designs~: Possibly a new quilt to giveaway? My giveaway is still going on---it will be closing at midnight on Thursday, and I will be picking a winner Friday morning....so if you haven't signed up--Hurry!! I've already found some amazing blogs through here and everyone of you have been very sweet and kind with your comments. I really am touched by all of your 'kind words'. Thank you. I've enjoyed having this giveaway so much so that I've been playing with the idea of another one. This is the quilt-top that I pieced together quickly with some vintage fabrics I found hiding in one of my plastic bins to be forgotten. I spent all Sunday morning piecing the soft neutral colors of fabric together and ended with a very nice soft combo. Just really soothing to look at. The picture does not give this quilt-top any justice. You'd think after working and finishing my last quilt in record time, I would be relaxing and taking a very needed break.....WRONG. This quilt is large enough for me to possibly break into 4 crib size quilts, if not maybe 2 good sized cribs.....opening it up to the possibility of 2 winners this time. This was made completely out of old vintage fabrics that still carry that scent of 'old'--I LOVE THAT SMELL :) Keep checking back as I may turn this into a giveaway..... Let me choose my winner first from my current one and finish theirs before this one gets going. My goal would be to have that giveaway just in time for two of you to receive a special Christmas Present from me. Gotta quilt this and add batting to it eventually. On another note, I promised several folks that I would have my pattern of my giveaway quilt ready by Friday at my etsy store. I never realized how hard it would be to put it in writing and making sure that it would be easy to understand and follow as well as Beginner and Pro friendly. I've come up with 2 different patterns for my heart quilt, and I'm really aiming to have it by Friday....here's what I've got so far. I definitely prefer working it out on graphing paper and then transferring it to computer when I'm done. Can you see the heart in there?? :) A little optical illusion for ya. So that concludes, the projects that went on in my home this weekend. I can't wait to pick a winner and be able to tell someone they won a quilt and possibly make their day? What did you do? Are you still collecting selvedge edges? I will be cutting some fabric this week and would be happy to save them for you. I like paper first, too. I can see your heart there. 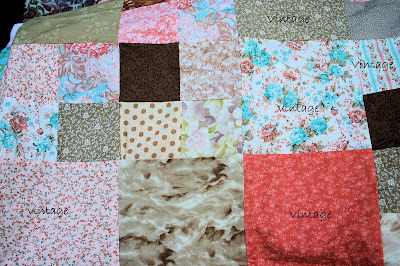 oh i love the soft colors of your vintage quilt, its beautiful. I love that pattern. I will check back to see when you have it in your shop for sale!! If I could make a quilt I doubt that I could give it a way. It would have to be for a worthy cause such as your heart quilt. Your heart is big and your heart quilt is awesome. This quilt here is also nice. I love vintage materials, dishes, pictures and jewelry. Hope your generosity is passed on to others. Another great quilt! Gorgeous handiwork once again! How old do fabrics have to be before they are Vintage? Your quilt looks great and it's so nice of you to give it away. I love love love the apron!! Your quilts are very pretty too! that top looks like something that would have been in my great-grandmother's home. I can smell her coffee as I look at it. Thanks for the memory. I love the quilt and I really love the apron. You are so good at what you do. I love visiting your blog. Lovely soft colors will fit into any decor. So pretty.